With a multitude of different places to acquire a kitten, and the relentless advertising by pet food manufacturers bombarding us with conflicting information regarding correct diet, it’s hardly surprising that many people are misinformed or confused about what they should feed their new kitten. There are a good deal of nutrition related diseases of cats, so feeding the right diet is very important. Feed a kitten on kitten food. 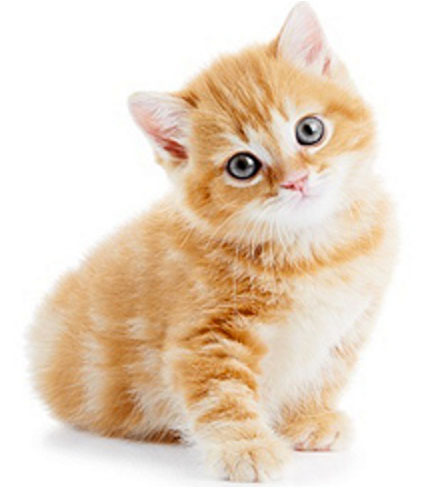 Kittens have very different nutritional requirements from adults, and serious problems can occur if you get this wrong, so it’s important that you pick a food designed specifically for growing cats. Some pet food companies refer to kitten food as “Growth,” but for our purposes, we’ll just call it kitten food. Kittens over 6 weeks of age have no requirement for milk. In fact many kittens will develop diarrhoea if you give them milk, so it’s best avoided. Wet food is available as either canned or pouches. Nutritionally, there is no advantage to feeding dry food in preference to wet (or vice versa). Some cats prefer to eat dry food, and some wet. There is no way of knowing your cat’s preference until you try it. However, dry food is more convenient to use; there is no need to open cans every day, it doesn’t have such a strong smell, and there is less waste because it will stay fresh in the cat’s bowl. It is also much cheaper. There are a couple of peculiarities that you should be aware of when feeding dry food. Cats appear to be more likely to overeat and become obese when fed dry food. You must follow the feeding guidelines on the pack, and monitor your cat’s weight closely. This is more of a problem with adult cats than kittens though. Cats have a peculiar metabolism when it comes to regulating water intake. When feeding canned food as the main or only foodstuff, your cat will get most of her daily water requirement in the food, (canned food is typically 80% water). However, dry food is only about 10% water, and the cat will require to drink considerably more if dry food is given to any great extent. There is no problem with this, but cats do not adjust well to rapid changes in water requirement. So, if you are changing to dry food from canned food, you should do this gradually over a period of about a week, to allow your cat’s water intake to gradually increase also. Cats are more likely to suffer from FLUTD when fed exclusively dry food. What Brand of Kitten Food? One of the most commonly asked questions in veterinary practice is, “Which food do you recommend?” At Vetrica we recommend Hill’s Science Plan®, which is a high quality, complete dry food. And with our VYP (vaccinate your pet) Bonus Plan, you can earn a free booster vaccination. Hill’s Science Plan® is specially formulated to reduce the incidence of FLUTD. When to Switch to Adult Food. Only move your kitten onto adult formula foods at 12 months old. Vitamin and mineral supplements take many forms, such as powders or tablets that you can buy from the pet shop; meat and bone meal, or good old-fashioned cod liver oil. At best, (if you have followed our advice above and are feeding a good quality kitten food), these products are a waste of money. At worse, they are harmful, and may be the cause of bone development disorders. Cat owners often feed raw meat. Raw meat should not be given to cats. Forget that it’s “natural,” because so is disease, and your cat is just as susceptible to Salmonella as you are! If you feed raw meat to your cat, and she gets Salmonella or worse Toxoplasma (a serious disease that is passed to humans via cat faeces), then you might catch it from your cat, irrespective of how well you may have cooked the same piece of meat for yourself. Both these diseases are very unpleasant indeed. Feeding liver is to be discouraged for two reasons. First, it is so highly palatable that cats can become addicted to it and will eat nothing else. Second, liver contains very high levels of vitamin A. If fed to excess, vitamin A causes fusion in the bones of the spine, resulting in a cat that cannot move her neck. This presents obvious problems. Cod liver oil has the same effect. A cat is not a small dog, and dog food is not a suitable diet for cats. Cats require a higher proportion of protein than dogs, as well as an absolute requirement for a number of other dietary components that dogs do not have. Feeding a cat on dog food, especially if given with any regularity is likely to have disastrous consequences. Do not do it. Human foods are best avoided because if fed in large enough quantities they will unbalance an otherwise balanced diet, and your kitten will quickly learn bad eating habits, refusing the kitten food in favour of the tastier human foods. Remember, bad eating habits are a learned behaviour. They only arise because you rewarded your kitten when she refused kitten food by coming up with something tastier. Left to their own devices, when fed to appetite, especially on an all dry-food diet, many kittens will overeat and become obese. This is not easy to spot because they grow so slowly when compared with dogs. In the first instance you should follow the guidelines shown on the pack, modifying the amount of food you give based on how well the kitten is growing. Regular weight checks are useful to monitor this.